Curious? I’m holding a live Moon Charting Mastery Workshop on March 31. So many of us women are stressed out, and this unconscious struggle against our natural rhythms is a huge reason why. But when we choose to stop seeing our periods as a curse and instead look deeper, we find that together, the four phases of the menstrual cycle offer a holistic circle of physical, mental, emotional, and spiritual information vital to a woman’s emotional and reproductive health. Especially for a woman on the fertility journey, the wisdom of her cycle is an essential missing element. Ready to heal? Join me in our Moon Charting Mastery live workshop. As hormones shift in the body with the completion of ovulation and preparation for menstruation, a woman’s energy turns inward. Like the moon waning toward darkness, she becomes more introspective, reflective, with a strong desire to retreat, be alone, go deeper. This is the ideal time for evaluation, journaling, meditation, seeking answers and asking for healing. Channel negativity into a yoga practice. Allow yourself to feel, without judgment, the pain that stays buried the rest of the month. It is said that right before menstruation, the veil between the physical and spiritual worlds is thinnest. It’s important not to ignore our powerful feelings at this time because they can give insight into the truths we’re unconscious of in the more outward phases of the cycle. This can be an intensely creative time if we allow ourselves to be exactly where we are and follow the energy where it takes us. Intrigued? 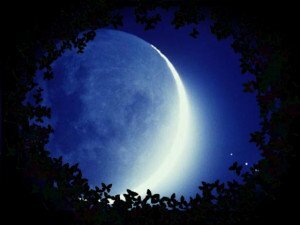 Learn to flow with your 4 goddess energies & chart your cycle with the moon. 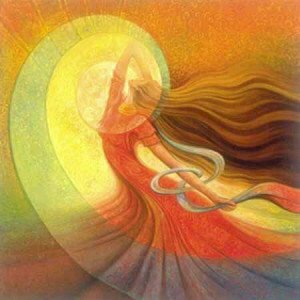 The final phase of the cycle brings us the wise woman: the quiet and intuitive energy of menstruation. The arrival of her period can be crushing for a woman who yearns to conceive. The moon is dark, and so are we. 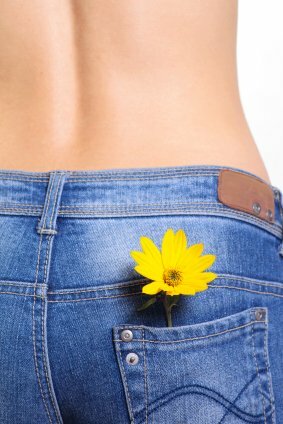 If it’s honoured, though, the energy of menstruation can open up an ideal space for the renewal and intuitive understanding needed on the fertility journey. The stress of pre-menstruation is released as we begin to bleed. During this phase our awareness is diffuse and we’re deeply attuned to the spiritual, so time spent alone in retreat from the intellectual and physical demands of everyday life, unplugging from the world to meditate, journal, and tune in to the quiet inner voice, can provide transformational wisdom and direction. During menstruation, practice extreme graciousness with your body and your heart, carving out time to be still, to listen, to assess your path, realign your perspective, and receive guidance for the month ahead. It can be challenging to make space for this kind of stillness—most of us are overrun with obligations and responsibilities that don’t have a pause button—but even half an hour of conscious connection with your inner self during this phase can help open you to deep emotional release and spiritual renewal. This is your new moon time. Drop into a space of reception that transcends rational thought. Open to the Divine, and let it speak. Together these four phases of the menstrual-moon cycle give women an amazing system of self-knowledge and renewal that can be revolutionary and so exciting to discover. I hope you’ll be as excited by this information as I was when I first stumbled on it. It changed my life and my relationship to my body completely. When you sign up for the workshop, you get my full Moon Charting Mastery program along with it. You get access to the Moon Charting Mastery program as soon as you sign up for the workshop. Get a head start with charting before the workshop, then bring me any questions that come up for you. This information changed my life, and I can’t wait to share more of it with you.